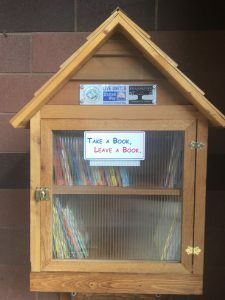 The Friends, in collaboration with Berkshire United Way and the Williamstown Community Chest, have installed a “Book House” at the back entrance to Williamstown Elementary School. As part of the United Way’s county-wide literacy initiative, the Book House gives kids access to books even when schools and libraries are closed. The Book House works on a very simple rule: Take a book, leave a book. If you find a book that interests you, take it home. If you have finished with a book that you would like to share, leave it in the Book House. All books should be appropriate for kids ages 1 to 12 years old. There are no limits on the number of books you can take or share. The important thing is to keep kids reading! Initially, the Friends will keep the Book House stocked and clean until we have trained interested children to be Book House Librarians, as a way to nurture their ownership of and pride in this endeavor. Thanks to Williamstown Elementary School for hosting the Book House and the Williamstown Department of Public Works (especially Ken McApline) for installing it.